Your cookie recipes are filled with baking terms. These terms are simply instructions to follow to make cookies. The Elf is here to help you understand these techniques so you can mix up magic in your own kitchen. Bake: use dry heat to cook food, usually in an oven. Beat: stir or whip with a spoon, electric mixture, wire whisk, or beater to create a smooth mixture of ingredients. The length and intensity of beating determines how thick the dough will be. During the beating process, the dough traps air. With continued beating, air cells break down into smaller sizes, allowing them to dissolve faster in liquid and thus move more slowly through the dough, creating a thicker texture. Blend: lightly mix two or more ingredients together with a spoon, whisk, blender, mixer, or processor until separate ingredients are no longer distinct, but combined make an entirely new mixture. When it comes to baking terms, blending is an even lighter version of mixing. Its goal is to merely incorporate ingredients together. Cool: reduce temperature until cookies are neither very hot nor very cold, often by allowing them to sit at room temperature. Cut in: use two knives or a pastry blender to combine cold fats (butter, margarine, or shortening) with dry ingredients (such as flour or sugar) without creaming or mixing air in the ingredients. A well-incorporated cut-in mixture has a crumbly or grainy texture. 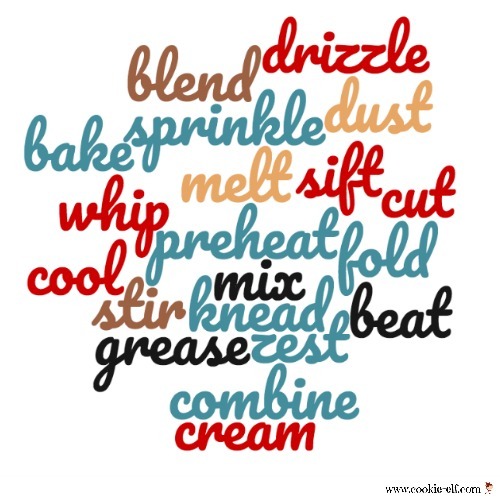 Drizzle: let icing fall in drops, particles, or a fine stream over the surface of a cookie or a mixture. Fold: gently incorporate a lighter mixture (or additional ingredients) into a previously beaten dough or batter (often a heavier mixture), with a light motion that preserves the air pockets already added to the mixture. Rubber spatulas or large spoons are often used to fold ingredients together by running the edge along the side of the bowl, scooping up portion of the heavier ingredient, and “folding” it over the lighter ingredient onto itself. Grease: rub pans with a small amount of unsalted shortening or butter, or spray pans with nonstick baking spray, so that when cookie dough is baked it does not stick to the pan. The layer of shortening should be a thin, even coating on the entire baking surface so the pan is shiny. Knead: work dough with the heels of your hands or with a mixer’s kneading attachment by folding it over and turning it after the dough is pressed. This repeated motion encourages gluten in the flour to stick together and form air pockets, which hold in air and allow dough to rise. Mix: distribute ingredients evenly throughout the dough until they are integrated into a new substance. Once mixed, no single ingredient can be individually identified. Preheat: turn on a cold oven and heat it to the temperature indicated in the recipe before the cookies are placed in it for baking. Most ovens take ten minutes or less to preheat to the proper temperature. Sprinkle: scatter sugar or toppings over the surface of a cookie or cooking icing. Sift: place dry ingredients in a sieve and shake it gently to remove lumps and blend the ingredients together. Stir: mix ingredients together with a spoon using a circular or figure-eight motion. Whip: incorporate air into batter to increase its volume by beating it a high speed with a mixer, beater, whisk, or spoon. Zest: grate, scrape, or shred the outer skin of a citrus fruit, using a grater, peeler, or zester.